Love, love, love, LOVE, LOVE these ladies. Holy moly. So much love. Originally featured on NOWNESS, this sweet, sharp short by filmmaker Lina Plioplyte is an inspiring glimpse into the lives of senior sartorialists– all of whom photographer Ari Seth Cohen has featured on his Advanced Style blog over the past couple of years. Cohen’s mission is as follows: to document “men and woman over 50 who are stylish, creative and vital” and to offer “proof from the wise and silver-haired set that personal style advances with age.” For younger clothes horses who view our wardrobe as a medium for artistic self-expression, the short also offers an uplifting peek into one possible future. 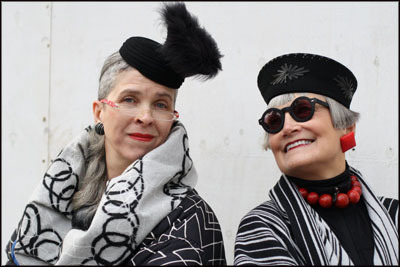 The Idiosyncratic Fashionistas! Filmed/photographed by Ari Seth Cohen. Walking around New York taking photographs, I noticed how many young girls are appropriating style from older women: leopard print, fur, turbans and hats. In general, the older women wear these things naturally, with more confidence. With the blog I not only want to show that older women are vital and creative, but also to show people [they need not be] afraid of aging—and personal style is a great way to showcase this. […] What is important to me is self-expression and what might inspire others. I love this so much. Older ladies are just wonderful when they’re this vibrant. This makes me feel much more positive about growing old – which is a while away. Still, very awesome! I’m with Gen – this is a wonderful snapshot of women really living to the fullest and enjoying themselves at an age where women are so often told they’re irrelevant. Awesome blog as well!